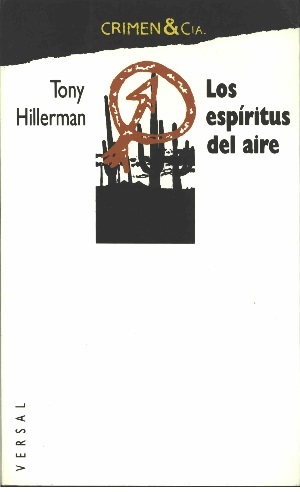 This is the Spanish paperback edition of Skinwalkers, the seventh book in Hillerman's Navajo Mystery Series. This edition was published in 1990 by Ediciones Versal in Barcelona, Spain. The text was translated into Spanish by Marco Aurelio Galmarini with the title translated as "The Spirits of the Air." The cover was designed by Joan Batallé. Binding: Paper covers printed in black and white with the series name printed in yellow and part of the cover art printed in red. The title, author and publisher are printed vertically in black on the spine. The front cover contains a fold out section that provides a short bio of Tony Hillerman and the back cover contains a fold out section that lists other titles available from Versal.